Posted on 8th September 2018 at 7:45 am. Time for a denim update, but which washes, cuts and details are trending? 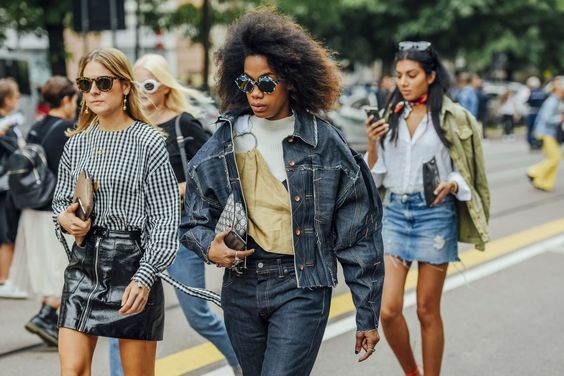 The level of creativity when it comes to denim is off the rails, and almost nothing surprises us anymore. A pair of jeans that are essentially made up of a handful of patches? It’s probably happening. Denim is no longer just denim. What once was a simple counterpart to a plain white tee and sneakers is now a clothing category all its own that’s exploding with trends. One-size-up menswear shapes are gaining ground, while tailored jackets are a perfect alternative to blazers. As for the details: fussy embroidery and logo patches for the fresh simplicity of deep indigo, preferably with super-refined top-stitching. Deep indigo is the crisp workaday shade to be seen in: stick to high-waisted, straight-leg, and wear with the want-it-now Western boot. The chicest detail in denim right now? An exposed stitch. Even better if it’s set to flatter, neatly bisecting your silhouette. A denim coat? Take the plunge. You’ll find it’s a handy wardrobe binder. A tailored jacket style is perfectly in tune with a slick ladylike sensibility. Don’t forget the chain-handle bag, tucked into the crook of an arm. White jeans should be cut roomy, and worn with sharply cut and cropped spring jackets. Dungarees are back and back to stay. Play with colour style and layering for the ultimately street style look.